Henry Strong wrote these letters to Otis B. Strong of Huntsburg, Ohio. Strong was in Company K, 12th Regiment, Kansas Volunteers from Paola, Kansas, during the Civil War. The letters were written from various places: Moneka, Kansas; Little Rock, Arkansas; Camp Blunt, Paola, Kansas; Fort Leavenworth, Kansas, Kansas City, Missouri; Osawatomie, Kansas; Fort Smith, Arkansas; Chattanooga, Tennessee; Mansfield, Kansas; Fort Gibson, Cherokee Nation. 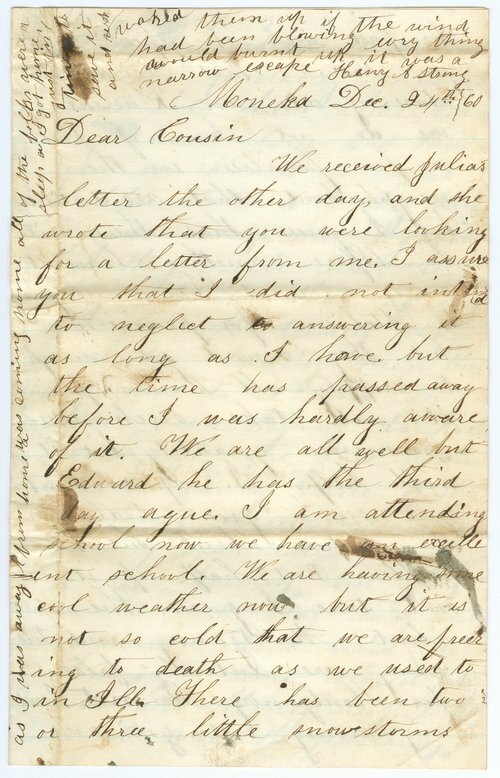 The letters address Strong's activities as a Kansas volunteer during the Civil War.